Soju brand, Jinro has unveiled some still cuts from their new ‘C’ soju CF, featuring actress Lee Min Jung and hip hop group DJ DOC. They tweeted, ‘Pictures of the lively atmosphere on set, uploaded exclusively on Twitter. Our pretty Min Jung and funny DOC shot a warm CF.‘ In the pictures, Lee Min Jung is seen wearing a blue off-the-shoulder top to match her flirty smile; DJ DOC showcased their usual energetic attitude. 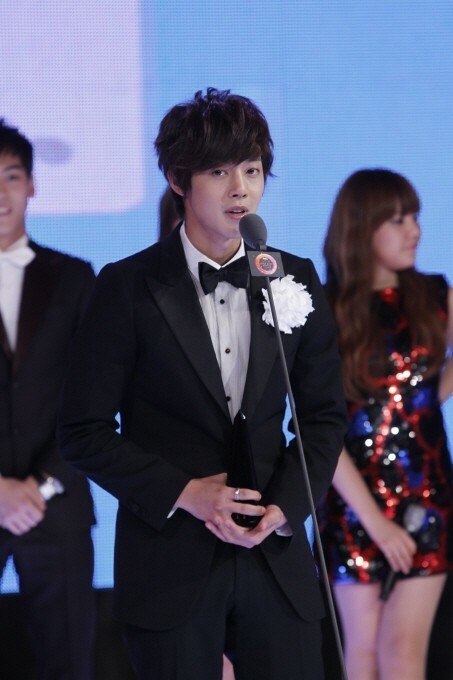 The ‘2010 Korea Lifestyle Awards’ was recently held at the Grand Intercontinental Hotel Grand Ball Room in Kangnam-Gu, Seoul on November 13th. Stars who attended include SG Wannabe, So Ji Sub, f(x), Lee Min Jung, and many more. The purpose of the awards show was to recognize leaders who have made an influence on Korea’s lifestyle in a total of 20 categories, such as fashion, weddings, social philanthropy, online shopping malls, medical institutions, cosmetic brands, hair brands, and others. The awards ceremony will be shown on December 15th through Donga TV. Check out some of the event pictures below. Actress Lee Min Jung recently answered questions posed by her fans. On December 3rd, Lee Min Jung uploaded a photo onto her Cyworld Minihompy wearing a white knitted hat with a snow covered mountain and a beautiful city next to the river in the backdrop. Surprisingly, Lee Min Jung actually answered these questions. Actress Lee Min Jung recently shot a new CF for Dove Shampoo. Having recently signed a new contract with Dove to promote the new ‘Dove Damage Therapy‘ line, Lee Min Jung shot a beautiful CF in white elegant dresses that accentuated her dark, silky smooth hair. The actress also directly recorded the song for the CF, which will be available for download in mid-January 2011 at the official Dove homepage. Various top stars attended the ‘‘2010 Style Icon Awards” at the CJ E&M Center in Seoul on November 17th, which is an events show that awards celebrities who are considered to be one of Korea’s representative ‘Style Icons’ for 2010.